Gold makes a good short-term investment, but the upside to holding on to your gold portfolio can be truly rewarding. The gold market has been tough for investors over the past few years, as many have seen price-per-ounce figures drop off significantly since just 2013. This drop in price would have been disastrous for those who placed a short-term stake in the market just three years ago, especially if they have a desire to liquidate now, but others are now enjoying the rapid rise that melds well with the bullish outlook in 2016. 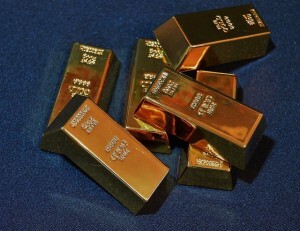 Short-term gold investing allows the investor to turn profits more quickly. Those interested in the futures market can enter into contracts that specify a price per ounce, an acquisition date, and a total weight in Troy ounces. Then, they simply have to wait until the target date to execute the contract. This amounts to short-term trading as the closing dates are often only available within a few months of the contract date. Short-term investing in this manner also opens up the option of using leverage to maximize your investment dollars. A 10:1 leverage ratio means you can theoretically purchase $5,000 worth of gold for just a $500 initial investment. This also means that a small investment can lead to big losses if the price of gold heads in the wrong direction. While leverage is a powerful tool that many investors use to maximize returns, it can also be inherently dangerous. From day trading to simply holding on to your investment for a year or less, short-term trading can be exciting and lucrative. It does require that you focus more intensely on the trade itself, as well as the overall market, the behaviors and buying habits of the general public, and world news and events. You really do have to time the market just right in order to reap profits in a short-term manner. Investing expert Warren Buffet famously stated that his preferred time to hold a stock is “forever.” While this has certainly worked out well for the Oracle of Omaha, investing in gold isn’t exactly the same as equities. One thing is certain, though: gold has historically delivered solid returns on a long-term basis. It is a proven hedge against instability and market turmoil, as well as low interest rates and financial uncertainties. Holding on to gold in the long run has proven to be quite lucrative for many investors, with some placing their entire retirement accounts or IRAs into gold-backed investments. Long-term gold investing is powerful because fewer fees are generally paid overall – since the positions are held longer and fewer trades per year are conducted, which keeps the costs related to the trades at a minimum. Long-term trading is also much more forgiving for newer traders. If you’re considering a gold investment to help solidify your retirement plans, let us know how we can be of service.